The Camera Preview screen is the main entry point activity displayed when the Imageotag app is started. 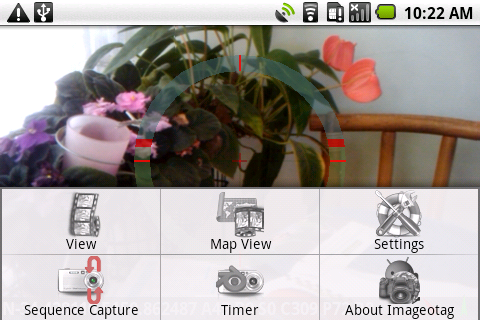 The Camera Preview screen shows the landscape camera preview display on which an artificial horizon is provided to assist with holding the camera level. At the bottom of the screen a status line shows some of the current sensor telemetry including GPS latitude, longitude, altitude, bearing, speed in Kilometers per hour, True North and Magnetic Compass direction, pitch and roll. 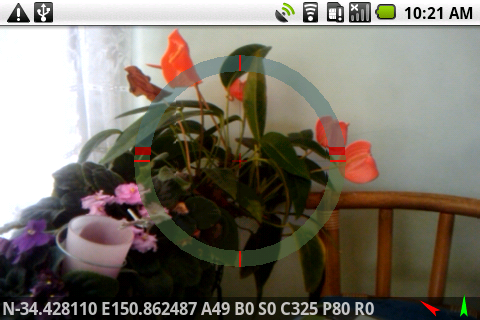 Camera zoom level is also show on supported devices. A red arrow indicates the compass direction and a green arrow indicates the GPS bearing direction. The standard Android status blind is also present at the top of the screen showing GPS status icon, as well as other Android status icons. Photos can be taken from the Camera Preview screen by pressing the camera snapshot button or the trackball button or the touchscreen. Press the touchscreen on the left to focus the camera only. Press the touchscreen in the middle to focus the camera and take the picture and press the touchscreen on the right to just take the picture. Devices which support camera zoom can use the trackball or D-Pad Up & Down buttons to zoom in & out. Imageotag V1.0.4+ now supports Camera Zoom by the pressing the touchscreen on bottom left to zoom out and on bottom right to Zoom in. NOTE that it is important to wait until a GPS fix is obtained in order to have accurate geo tagged information recorded when taking photos. A GPS fix is obtained when the GPS icon on the status blind stops flashing. Where it is not possible to obtain a GPS fix, geo tagged locations can be later adjusted from within the Photo Map View. The Camera Preview screen provides Menu items to View Images, Map View, Settings, Start and Stop Image Sequence Capture recording, Start a 10 second Self Timer and About Imageotag. The View menu item will invoke the Image View activity. The Map View menu item will invoke the Image Map View activity. The Settings menu item will invoke the Settings activity. The Sequence Capture menu item will Start and Stop Image Sequence Capture recording. The Timer menu item will start a 10 second self timer after which a single photo is taken. The About Imageotag menu item will invoke the Web Browser app displaying these Imageotag web site pages.